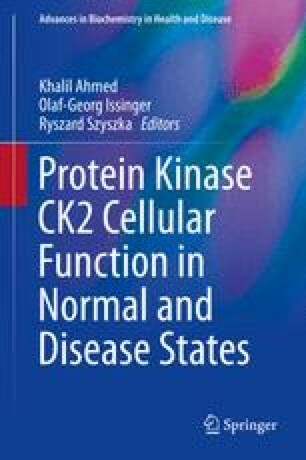 CK2 is a signal-responsive serine/threonine protein kinase which promotes cell proliferation, suppresses apoptosis, and demonstrates increased expression in numerous cancers. Here, we present information on investigations into CK2-focused cancer therapy in general and discuss in detail a nanomedicine approach to targeting CK2 in a cancer cell-specific manner. Specifically, we summarize data on biodistribution and therapeutic efficacy of a tenfibgen (TBG) nanoencapsulation technology for the delivery of anti-CK2 cargos to malignant cells. The TBG nanocapsule cargos discussed include siRNA (siCK2), single-stranded DNA/RNA chimeric oligonucleotides (RNAi-CK2), and a small-molecule CK2 inhibitor (DMAT). Systemic administration of TBG-RNAi-CK2 resulted in xenograft tumor reduction using low doses with concomitant reduction in CK2 protein expression. Systemic TBG-DMAT treatment decreased xenograft tumor proliferation. No toxicity or early inflammation response was observed after using any of the TBG encapsulated anti-CK2 cargos. The utility of this therapy approach for targeting metastatic cancer sites and on overall survival is also discussed. Protected and malignant cell-specific delivery of a therapeutic is a promising target-specific and versatile approach for cancer therapy, and both the TBG encapsulation technology and the anti-CK2 oligonucleotide approach demonstrate substantial potential for the treatment of malignancy.